The SAMR model is a great way to assess whether or not technology has had an impact on student outcomes. 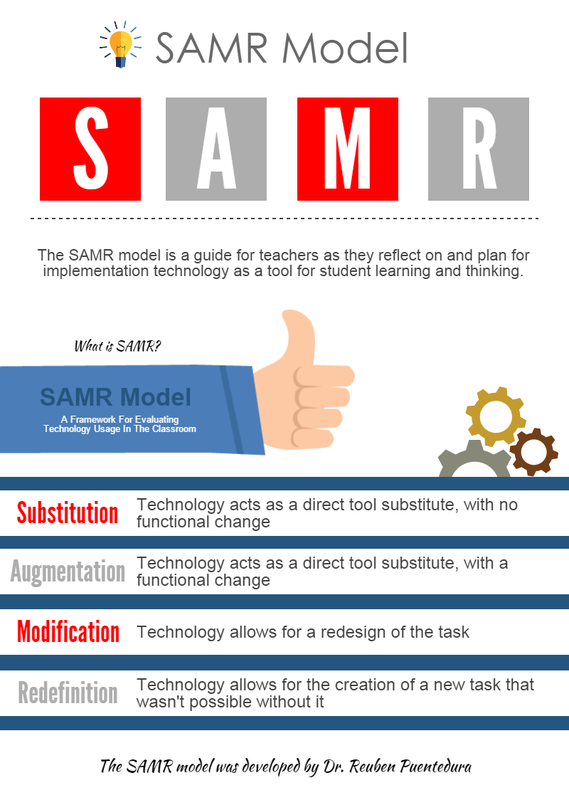 The SAMR model was designed by Dr. Reben Puentedura and the Acronym represents 4 main levels of technology integration. Let's use Google Docs as an example of how this might look in the classroom. Imagine a teacher has their class download a Google Doc "Handout" from School Space to be read aloud and stored digitally on a student's laptop. This would be an example of substitution. The technology has replaced a traditional tool with no functional improvement. Even if the class were typing their essay in a Google Doc vs. traditional pen and paper, no real noticeable change has occurred. Google Docs is just a substitute for pen and paper. Teachers could take this to the next level; augmentation if they were to embed teacher comments into the doc rather than having to pass hard copies back and forth between teacher and student. Modification might occur if the teacher takes the commenting feature a step further by having the class peer edit one another's Google Doc through sharing and feedback from their classmates. Lastly, redefinition allows for students to do something that would not have been possible without the aid of technology. For example, if students were publishing their Google Docs online and receiving feedback and differing perspectives from experts outside the classroom walls.